Bad Kreuznach is a Spa town in Germany and got its name from the baths which contain the noble gas radon, with supposedly curative properties. 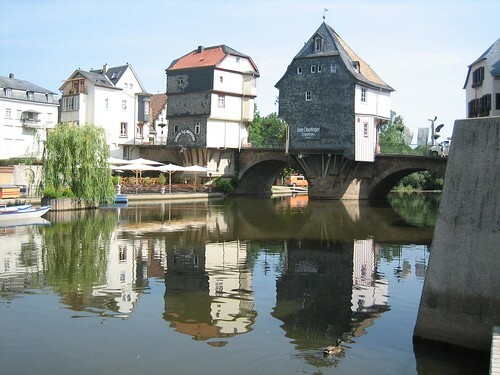 The landmark of Bad Kreuznach is an interesting bridge on River Nahe with houses on its piers. 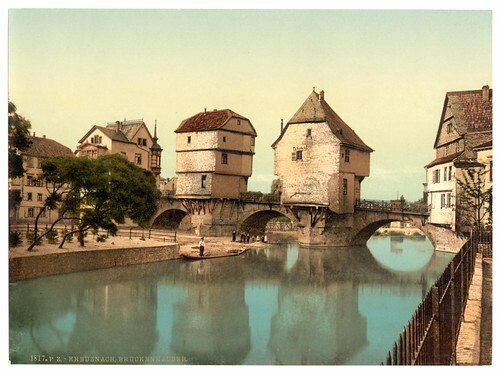 The bridge with its eight arches was built around the year 1300 and these fascinating bridge houses, an architectural delicacy and symbol of Bad Kreuznach, were built from 1480 onwards. The houses are half-timbered and parts of the houses jutting out are supported by wooden buttresses. The first photograph shown below was taken around 1900 and the second on June 14, 2007. Unfortunately I could not find much information about these houses and if any reader has more info than same may please be sent to me for inclusion here. I was born in Bad Kreuznach back in 1956. I have a pictrue, that was made for my 1st birthday present, that is inlaid wood of the houses on the bridge. I cherish this picture. I was also born there in 1955. My father was in the US Army Corp of Engineers. On my bucket-list to go back someday and visit. My husband and I bought a painting of the Bridge Houses at Bad Kreuznach in an estate sale. I believe the artist last name was Haffner. It was painted in the late 60's and I'm curious if anyone knows this artist?